Safeway Hawaii presented a donation of $109,773.55 ($5,704.80 donated from Safeway Big Island stores) to the Hawaii Foodbank as a result of Safeway’s “Help Us End Hunger” holiday food drive and Hawaii Foodbank’s “Check-Out Hunger” fundraising campaign. Thanks to Safeway customers, 7,213 bags of groceries were sold at check out stands and donated to those in need this past holiday season. The specially packed grocery bags provided customers with an easy way to make a donation while ensuring that food bank recipients received the items they needed most. The bags, priced at $10 each, contained Safeway and Kraft products. The donations from Safeway benefit food banks on each island – Hawaii Foodbank on Oahu and Kauai, Maui Food Bank and The Food Basket on the Big Island. 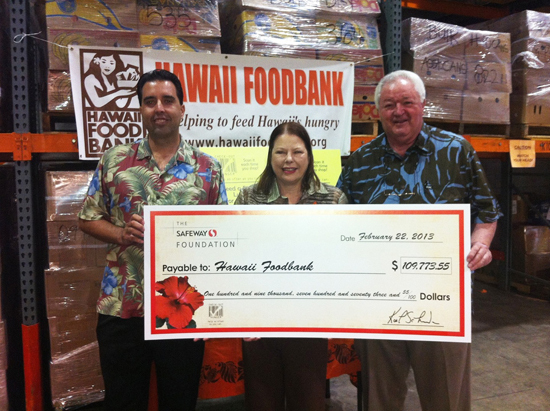 Last year, Safeway Hawaii donated $91,117.76 to the Hawaii Food Bank. Every donation received helped feed one in seven people in Hawaii – more than 14 percent of the state’s population – who must turn to a food bank for assistance. Nationally, Safeway and Kraft Foods donated a total of 700,000 bags of groceries to food banks and other hunger relief centers across the country. Kraft Foods provided a special holiday gift in the form of a grant to several local food banks in each of Safeway’s U.S. operating divisions. The cash donation helped food banks provide roughly 2 million meals. Safeway is a major supporter of food banks and in total, Safeway and The Safeway Foundation donate an average of $200 million a year in grants and product donations to charitable organizations. Safeway Inc. is a Fortune 100 company and one of the largest food and drug retailers in North America, based on sales. The company operates 1,641 stores in the United States and western Canada and had annual sales of $44.2 billion in 2012.